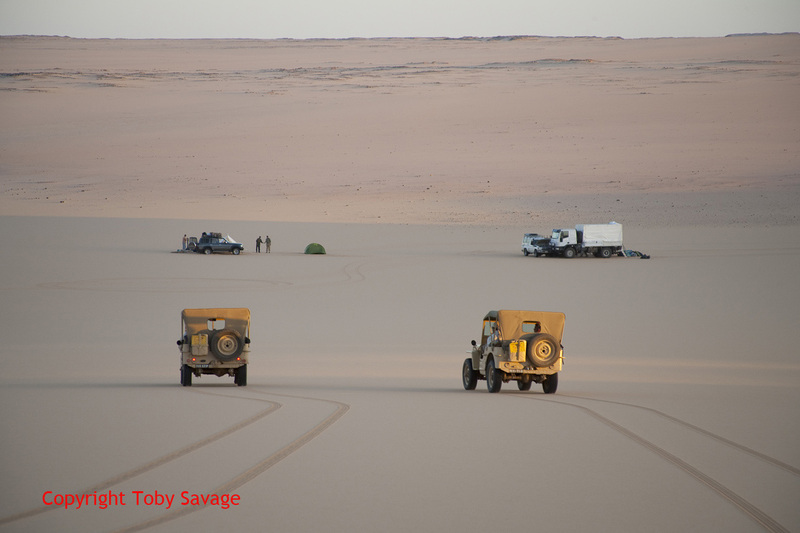 Sand, Wind and Stars - LRDG, 70 years on: Carry on Camping. 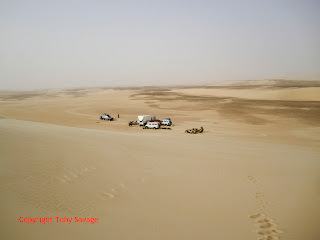 Camping in the desert is a wonderful experience. Watching the sun set over massive dunes, settling down around a good fire, then falling into a tent as the night chill begins to bite. 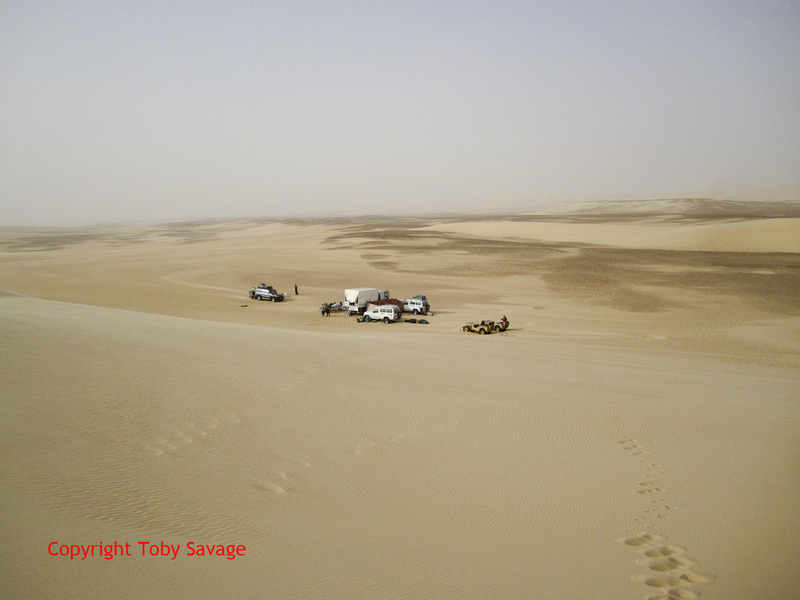 On this trip up through the Great Sand Sea we had little of that. A persistent strong and dust filed wind from the south for the first few days, swinging round to a northerly for the last two days. The problem with this was that it happened in the middle of the night. 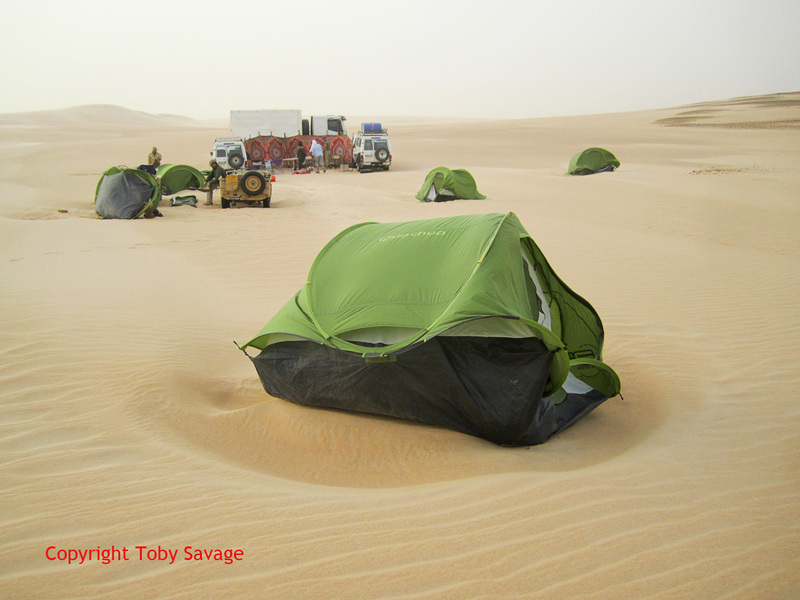 We retired with a hot sticky southerly - tent doors facing north, but as the wind swung round in the night our tents morphed into a wind blown shapes and filled with at least a bucketful of sand each! Bob reported that he went out for a pee in the night and could not see a thing for the swirling sands. The wind hit a maximum of 37 kph according to data retrieved by Jason upon our return. Character building stuff! 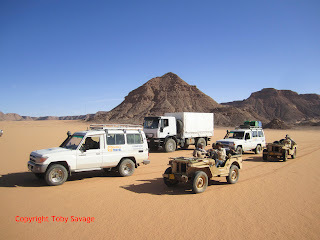 Our logistics team supplied by Siag Travel did a wonderful job of supplying three meals a day in all conditions and never was there a grain of sand in anything. Top marks to Taraq, Mohamed and Islam. Pics show, the team about to hit the sand, the Jeeps descending to the camp, a long shot of a dusty camp near ‘Russian Well’ and our tents after the sand storm. Tell me: does sound travel in the desert? I mean, if you let one off, does everyone within twenty miles hear it? 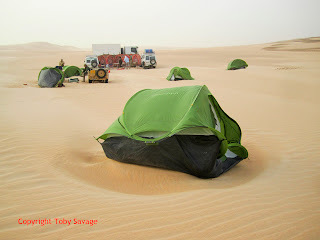 And, how do you peg a tent down in the sand....or do they just stay in place when you are in it? More great photos.....more silly questions!